Two suicide bombers struck the Cathedral of Our Lady of Mount Carmel in Jolo, Sulu earlier today. The twin bombings were quickly claimed by the Islamic State, which has long sought to terrorize Christian houses of worship in the Philippines. 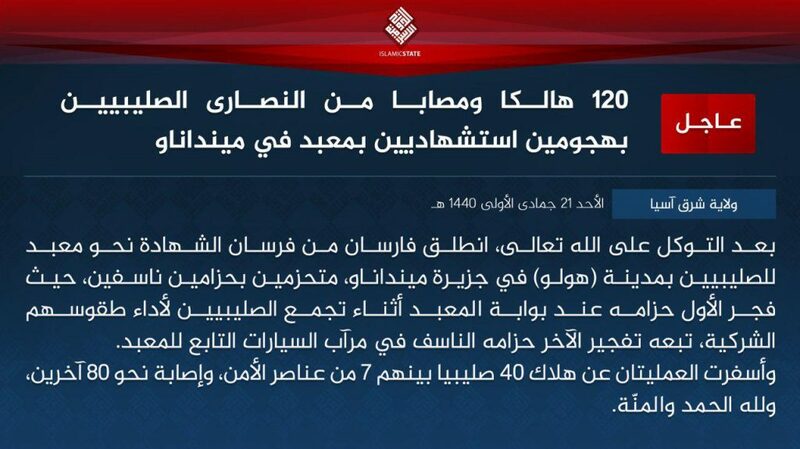 The Islamic State describes the target as a “Christian temple,” saying that it was bombed during a “gathering of the Crusaders to perform their polytheist rituals.” The first suicide bomber purportedly “detonated his explosive belt at the gate,” while the second blew himself up in or near a “parking garage.” The self-declared caliphate claims that “40 Crusaders,” including seven “security guards” were killed, and approximately 80 others were wounded. The Islamic State’s brief account of the attack is generally consistent with independent reporting. Col. Gerry Besana, a military spokesman, said the two bombings occurred first inside and then outside of the church. The second “exploded in a nearby parking lot as congregants panicked and rushed outside,” according to The New York Times, which summarized Besana’s remarks. The casualty count is still not final, but has steadily climbed throughout the day, as dozens are among the dead or injured. Authorities in the Philippines quickly pointed the finger at the Abu Sayyaf Group, which has a long history of targeting Christians. The Abu Sayyaf Group, which was affiliated with al Qaeda, swore allegiance to the Islamic State in June 2016. It is not clear how many members of the group remained loyal to the so-called caliphate after the death of Isnilon Hapilon, the Abu Sayyaf leader who swore his fealty to Abu Bakr al-Baghdadi, in 2017. But some of its factions are clearly still part of the Islamic State’s network, which has worked to enhance the operational capacity and connectivity of jihadists in the region. The Islamic State claimed that today’s bombings were conducted by its East Asia “province,” which includes Abu Sayyaf’s factions. Whether operating as Abu Sayyaf or the Islamic State, the jihadists have long targeted Christians in the Philippines. According to The Straits Times, Abu Sayyaf targeted the Cathedral of Our Lady of Mount Carmel at least twice before — once in 2010 and again in 2013. Citing Octavio Dinampo, a “peace advocate” who was abducted by Abu Sayyaf in 2008, the Inquirer reports that a new bomb plot targeting the church was discovered several months. A street in front of the cathedral was closed for security reasons, but reportedly reopened after local residents claimed. The Abu Sayyaf Group has terrorized other churches in the Philippines as well. The Islamic State has encouraged its loyalists to strike churches and Christians around the globe. A family of Islamic State supporters carried out suicide bombings at three churches in the Indonesian city of Surabaya in May 2018. Egypt’s Coptic Christians are frequent victims of the jihadists, as churches and civilians have been attacked multiple times. In Feb. 2015, the Islamic State’s Libyan arm released a grisly video documenting the mass murder of 21 Egyptian Copts on the coast of the Mediterranean. On July 26, 2016, a pair of jihadists assaulted a church during morning mass in Normandy, France, killing an elderly priest and taking several people hostage before being gunned down by police. The Islamic State’s Amaq News Agency released a video showing the two swearing an oath of allegiance to Baghdadi shortly before carrying out the murder. In June 2017, the Islamic State’s Amaq News Agency released a video showing the destruction of a church inside the city of Marawi. The jihadists briefly held the southern Philippines city before being ejected by the military and security forces. These are only some of the plots and attacks carried out by the Islamic State’s global membership against churches and Christians. Of course, the overwhelming majority of the group’s victims are Muslims in the areas where it operates. Maybe it’s time for Duterte to go to work and do his magic on some payback for killing Christians.